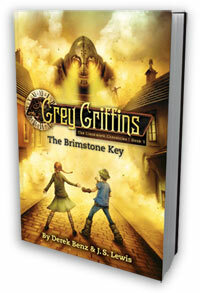 The Brimstone Key by Derek Benz and J.S. Lewis is the first book of a new Grey Griffins series called The Clockwork Chronicles. This is the second middle grade steampunk book that I’ve read (Leviathan being the first), but The Brimstone Key doesn’t take place in a mythical past, but rather in an altered-present version of Avalon, Minnesota. This small town is populated with clockwork and MERLIN technology, faeries, and a range of assorted creatures and magic almost too numerous to count. The Grey Griffins are a quartet of twelve-year-old monster-fighting heroes that attend Iron Bridge Academy, a sort of Hogwarts-gone-steampunk, and use Round Table cards, which are like an enchanted Pokemon deck, to train to fight monsters and eventually the Clockwork King. I felt in want of a Pokedex to keep track of all the creatures and characters, and that is partly because The Brimstone Key is actually the fourth Grey Griffins book (the first three being The Revenge of the Shadow King, The Rise of the Black Wolf, and The Fall of the Templar). There is so much history our heroes have traveled through together, and The Brimstone Key jumps right in without missing a beat, so I highly recommend reading the first three books prior to The Brimstone Key. That being said, the book is jammed full of technology and magical creatures that middle grade readers will delight in. The four Grey Griffins are twelve, and the feel of the books are solidly middle grade with a few puppy love stirrings, but no kissing or other yucky stuff (DarkOmen, age 11, enjoyed it, but wants to start over with the first books). The scariest scene in the book actually comes in the prologue, where we see a glimpse of the chamber where some evil experiments are performed on changelings (humans with faerie blood). While there is some discussion of the disturbing nature of the experiments and some of the chamber is shown, all the actual violence in The Brimstone Key is safely comic-book in nature. Unless your child is very sensitive, The Brimstone Key should be fine for readers ages 8+. Given the advanced reading level at 5.4, and the vast array of gadgetry and monsters, younger advanced readers will find The Brimstone Key setting their minds spinning like clockwork. You can learn all about the Grey Griffins books at Lewis’ website. I’m giving away my copy of The Brimstone Key and more in the Steampunk Prize Pack of Awesome Giveaway. Click here to enter! When you’re done entering my contest, hop over to Matt Delmann’s site for another chance to win The Brimstone Key! Tomorrow: We will have a guest post from Jon S. Lewis, so be sure to stop back! hi miss susan! i got this book from winning a contest. its soooo cool. i didnt read the first books but i could want to cause i like this one so much. I'm here tonight to get you back on my list of those I follow! Over the weekend, a glitch in my blog forced me to delete it and create a new one, with almost the same title; I exported and then imported everything, but you don't get your followers back! But I did copy out the list of Blogs I'm Following. Now I just have to let everyone know what happened so they’ll be able to find me, and so I'll know when they post something. I saw this book last week on someone's blog for the first time. It looks so good. I'll have to read this one.